Background: Pancreatic pseudocysts are a relatively common complication of acute pancreatitis. While there a number of approaches to the management of pseudocysts, internal surgical drainage is generally the most effective in preventing recurrence. The use of minimally invasive techniques for pseudocyst drainage is rising. The use of the da Vinci surgical system allows for a stable, magnified, high-definition view of the surgical field. 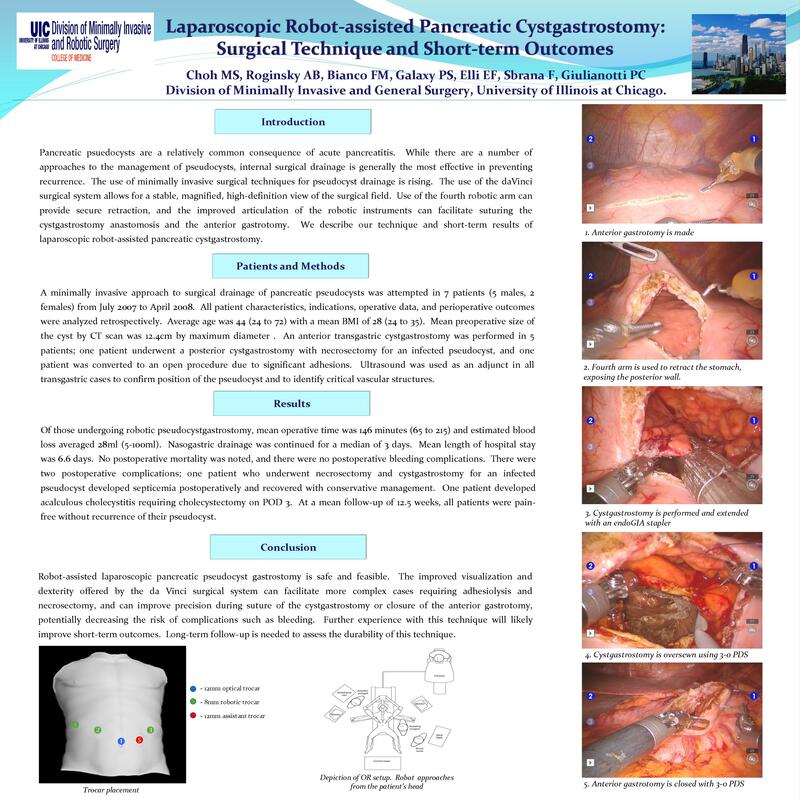 Use of the fourth robotic arm can provide secure retraction, and the improved articulation of the robotic instruments can facilitate suturing the cystgastrostomy anastomosis and the anterior gastrotomy. We describe our technique and short-term results of laparoscopic robot-assisted pancreatic cystgastrostomy. Methods: A minimally invasive approach to surgical drainage of pancreatic pseudocysts was attempted in 7 patients (5 males, 2 females) from July, 2007 to April, 2008. All cases were attempted with the aid of the da Vinci Surgical System. Data regarding patient characteristics, indications, operative data, and perioperative outcomes were analyzed retrospectively. Average age was 44 (24 to 72) with a mean BMI of 28 (24 to 35). Mean preoperative size of the cyst by CT scan was 12.4 cm by maximum diameter. An anterior transgastric cystgastrostomy was performed in 5 patients; one patient underwent a posterior cystgastrostomy with necrosectomy for an infected pseudocyst, and one patient was converted to an open procedure due to significant adhesions. Ultrasound was used as an adjunct in all transgastric cases to confirm position of the pseudocyst and to identify major vascular structures. Results: Of those undergoing robotic cystgastrostomy, mean operative time was 146 minutes (65 to 215) and estimated blood loss averaged 28ml (5-100ml). Nasogastric drainage was continued for a median of 3 days. Mean length of hospital stay was 6.6 days. No postoperative mortality was noted. No postoperative bleeding complications were noted. There were two postoperative complications; one patient who underwent necrosectomy and cystgastrostomy for an infected pseudocyst developed septicemia postoperatively and recovered with conservative management; one patient developed acalculous cholecystitis requiring cholecystectomy on POD 3. At a mean follow-up of 12.5 weeks, all patients were pain-free without recurrence of their pseudocyst. Conclusion: Robot-assisted laparoscopic pancreatic cystgastrostomy is safe and feasible. The improved visualization and dexterity offered by the da Vinci surgical system can facilitate more complex cases requiring adhesiolysis and necrosectomy, and can improve precision during suturing of the cystgastrostomy or closure of the anterior gastrotomy, potentially decreasing the risk of complications such as bleeding. Further experience with this technique will likely improve short-term outcomes. Long-term follow-up is needed to assess the durability of this technique.